widow of Pompey in Corneille's Mort de Pompée. Collection of the Comédie française. 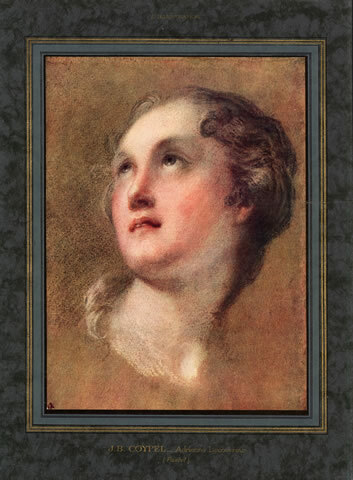 This pastel portrait of Adrienne Lecouvreur in the role of Cornélie is by far the most widely reproduced of her portraits. It was well-known throughout the 19th century through the engravings of Pierre Drevet, who produced several variations. In this case too, the original has reappeared only recently, being put up for public auction in 2005 at Vichy. As predicted, the sale was preempted and the portrait acquired by the Comédie française for 30,000 Euros. According to the Dictionary of pastellists, the portrait originally belonged to the comte d'Argental and was bequeathed on his death in 1787 to Mme de Vimeux, who was possibly his illegitimate daughter. It later came into the possession of the. Maréchal de Castellane and his descendants. See Queens of the French stage by H. Noel Williams (1905), p.127. In regard to the merits of the two portraits, there seems to be considerable difference of opinion. 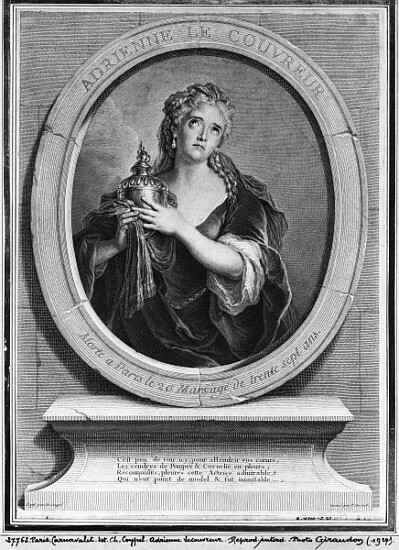 Michelet, in his Histoire de France, speaks with enthusiasm of the painting by Coypel, reproduced in this volume, in which Adrienne is represented as Cornélie in La Mort de Pompée, weeping over the urn of her husband, which she holds clasped to her breast. "She must have exercised a terrible power over hearts, to have been able to transform beasts into men, to have caused the feeble and mediocre Coypel to paint such a portrait. An inspired artist of our time, our first sculptor, Préault, told me that he knew not a word of the history of Mlle. 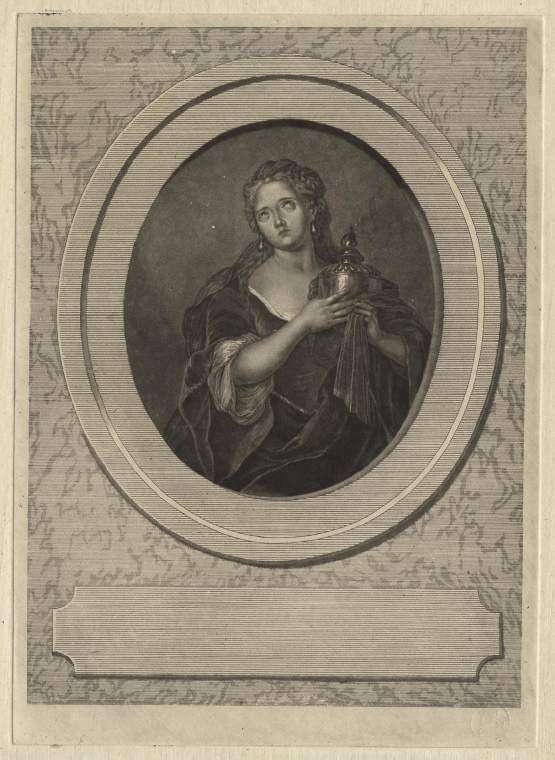 Lecouvreur when he saw this engraving. He was very affected by it, enraptured, and he seized upon it greedily.... It is more than a work of art, it is, as it were, a dream of grief. Those heavenly eyes, suffused with sublime tears, the gesture of those arms clasping the funeral urn, the grief expressed by that countenance, the silent accusation which that whole figure brings against destiny, all make of this picture a unique work, an honour alike to painter and model." 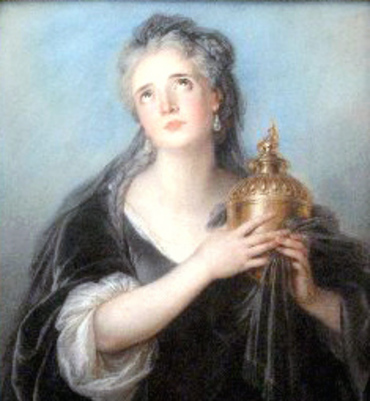 M. Larruomet agrees with Michelet: "I, for my part, am of opinion that if Charles Coypel, as a rule an artist of but moderate ability, invented the pose of this portrait, he had, by chance, an inspiration of genius, and that, if he only borrowed it from the actress, she possessed that innate sense of attitude which we admire in our own day (1892), in M. Mounet-Sully and Madame Sarah Bernhardt, and which alone would have sufficed to make of them great actors." M. Larroumet declares the portrait to possess "the incontestable merit of being a superb work of art," and greatly prefers it to the one by Fontaine, which shows us the actress "en robe de chambre," with her hair dressed in the fashion of the day. In the latter he can see only a "tableau d'apparat" of but little merit. On the other hand, Régnier, M. Maurice Paléologue, and M. Georges Monval, to the last of whom we owe the publication of Adrienne's correspondence, give the preference to Fontaine's work. "It is a truer, a more human, a more lifelike, a more familiar Adrienne," remarks M. Monval, who stigmatises the portrait by Coypel as "a fantastic and studied picture, a tête d'étude, a banal figure, under which one might equally well inscribe the name of Magdalene repentant, or of Sophie Arnould." For ourselves, while on the whole inclined to endorse the high opinion which Michelet and M. Larroumet have formed of Coypel's portrait, we cannot but think that the latter has unduly depreciated that by Fontaine, which appears to us both pleasing and natural." Note: All four of these attested portraits have been rediscovered since 1905 and can be found on the internet. I have reproduced them in my posts on Adrienne.